Velocity Track & Field Academy at Centre College. them to stick with their sport. We can change their lives,"
said Clark-Riley, a three-time Olympian. In 2000, a rumor circulated through the Olympic village before Team America's talent show that Hazel Clark-Riley, a middle-distance runner, was a singer and planned on dropping everything to pursue a career in music. It turns out that this story was concocted by Clark-Riley and her friends to catch the team off-guard when she actually got up to sing. When she made the Olympic team again in 2004 and 2008, she repeated the story to the new members who, after listening to her perform, "didn't want to tell (her) that (she) was awful." Though she may never become a famous musician, Clark-Riley is still a well-known athlete who has run the 800 meters at three Olympic games. Her personal best is 1:57.99. She also comes from a rather famous family: her older sister is a four-time Olympian while her father, a high school educator, was the inspiration for the film "Lean On Me." Because her siblings were involved in sports, Clark-Riley tried to find one that she enjoyed. "I tried figure-skating first," she said during a break at the Maximum Velocity Track & Field Academy at Centre College, "but I would always fall on the ice. I tried equestrians and soccer...I tried everything." Eventually, her father took her to a track meet where she ended up in last place. She persevered, and a year later, she was the number-one high school runner in the nation. "I got offers from everywhere, including places like Stanford," Clark-Riley said, "but I chose the University of Florida, where my brother (J.J. Clark) was coaching at the time." While at Florida, she won five NCAA titles and was inducted into their Hall of Fame in 2012. She has since gone on to be "number-one in the nation at every level." The secret to maintaining her longevity, she said, was having a great support group. The Olympic games were often a family affair for Clark-Riley, as her brother coached her, her sister Joetta, and sister-in-law, Jearl, prior to the 2000 Olympic games. The trio went on to place first-second-third in the 800 meters and made history. Because of this, the Sydney Olympics are her favorite out of the three games she has attended. "Anyone who went will tell you that Australia was the best," she said. "It was beautiful. They went all-out with the Olympic village. There were movie theaters and hair salons, anything you could think of." Now, Clark-Riley is acting as a clinician for the middle distance runners at the Maximum Velocity Track and Field Academy, an intensive four-day camp held on Centre's campus. She recently returned from running a track clinic in Fiji with fellow Olympian and clinician Dwight Phillips; the two have their own company and travel three to four times a month to host track clinics around the world. "We have the power to impact lives," she said. "Through working with the kids, we might inspire them to stick with their sport. We can change their lives." 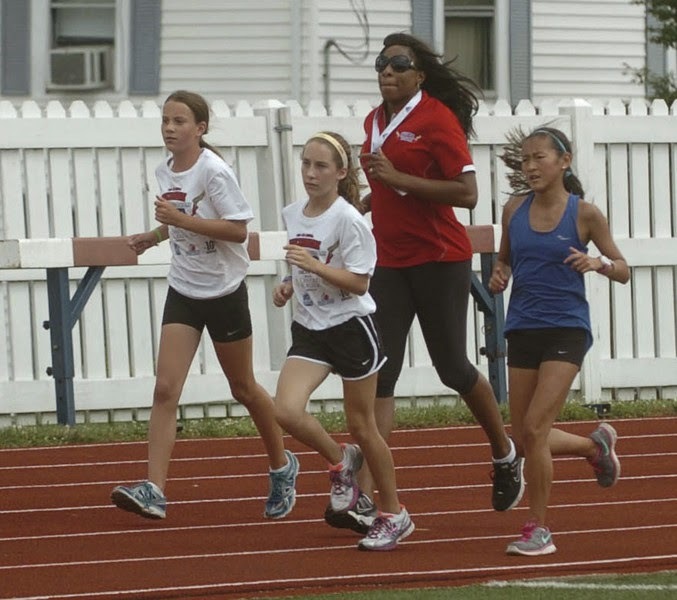 When teaching the kids about track and about life, she draws from her own experiences. "My career wasn't perfect," she said. "There were a lot of ups and downs. I try to teach them that sometimes, you have to make sacrifices to get what you want. There were days when I would have to get up at six a.m. and run when I didn't want to. Things worth having aren't easy to get." She also tries to teach the kids to support one another and "live a life of service." At the end of their week together, Clark-Riley hopes that the kids will take away a crucial life lesson -- to never give up. "Everyone can go through the ups and downs of life and overcome," she said. "I want them to know that they can achieve whatever they set their minds to. They can win a gold medal in whatever they choose to do in life."